There has been a lot of change surrounding the Games season this year, but one thing that didn’t change was the subtle brutality of the opening workout. The first workout of the the 2019 CrossFit Games Open is now complete. There has been a lot of change surrounding the Games season this year, but one thing that didn’t change was the subtle brutality of the opening workout. 19.1 was a simple yet devastating couplet of wall balls and rowing with 15 minutes of 19 reps/calories, respectively. 18.1, by contrast, opened up with a similar-feeling 20-minute triplet, also featuring rowing for calories. There were only a few strategy decisions needed in 19.1. The first challenge was finding the proper cal/hr row pace that would maximize performance over the 15 minutes. This is tough because if you come out too hot, things start to get real at the eight- to 10-minute mark. For wall balls, it was the decision to go unbroken, break once, or break more and just try to minimize rest. The final piece was transition speed. The hard-fought seconds gained on a slightly hotter row pace can be easily squandered by less-than-disciplined transitions on and off the rower, as well as precious seconds lost to extra-long gazes at the wall ball before picking it up and getting to work. In the last two years, we’ve seen growth in the share of masters athletes competing in the Open. The masters athletes now represent 46 percent of all Open participants, up five percent from 2017. Teen participation is holding steady at two percent, and the individual division, ages 18-34, is still the largest group at 52 percent. 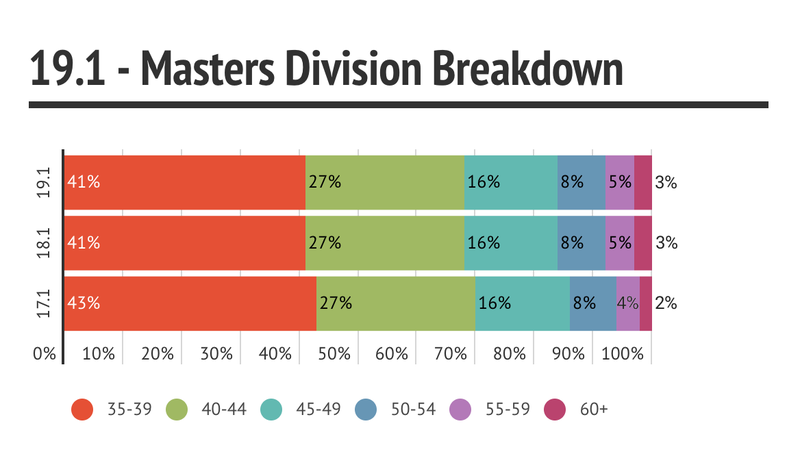 Diving a little deeper into the masters divisions, we see that the bulk of the masters athletes are in the 35-39 and 40-44 age groups. Last year the two eldest divisions each gained a percentage point, and they’ve held on to them for 2019 as well. 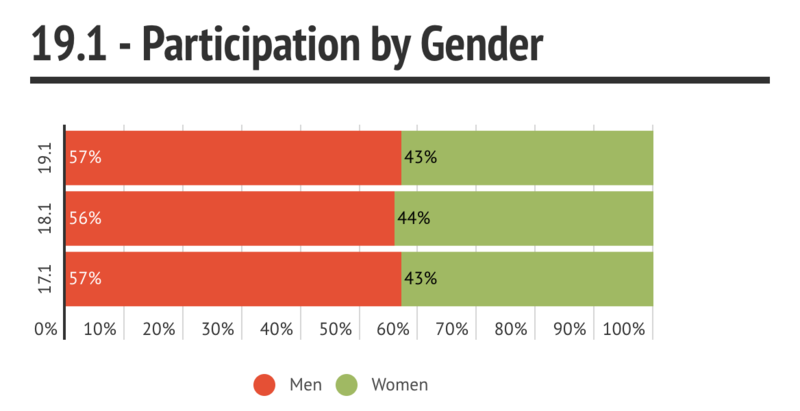 The gender breakdown of the Open has stayed pretty consistent over the past three years, returning to 57 percent men and 43 percent women for 2019. For the first time in CrossFit Games history, the top individual athletes in each recognized country will earn qualifying spots to the CrossFit Games. Although CrossFit has its origins in the United States, it is now an international phenomenon. There are currently CrossFit affiliates in over 160 countries. The number of international competitors has been growing steadily over the past several years, now making up nearly 50 percent of Open participants. 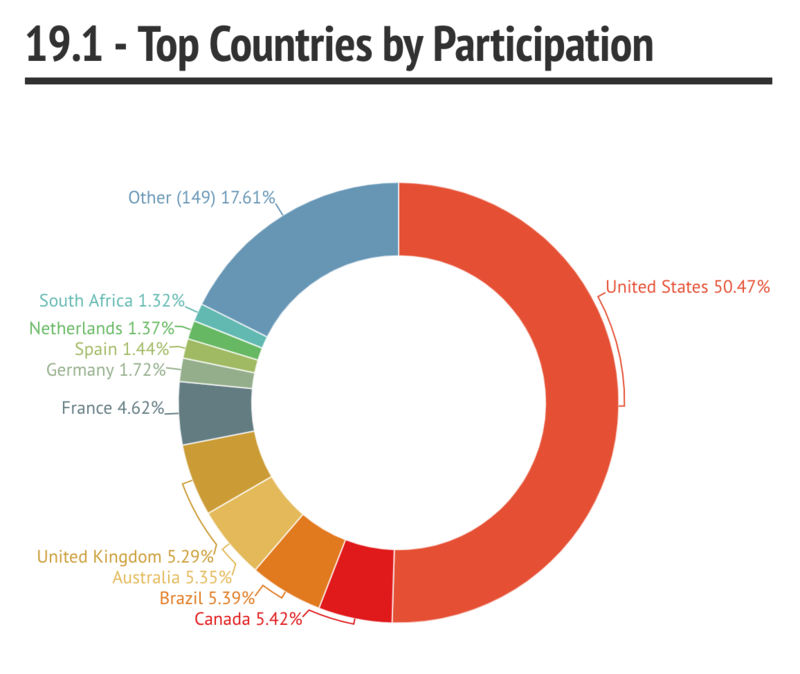 The top five countries in the Open by participation are the United States, Canada, Brazil, Australia and the United Kingdom. 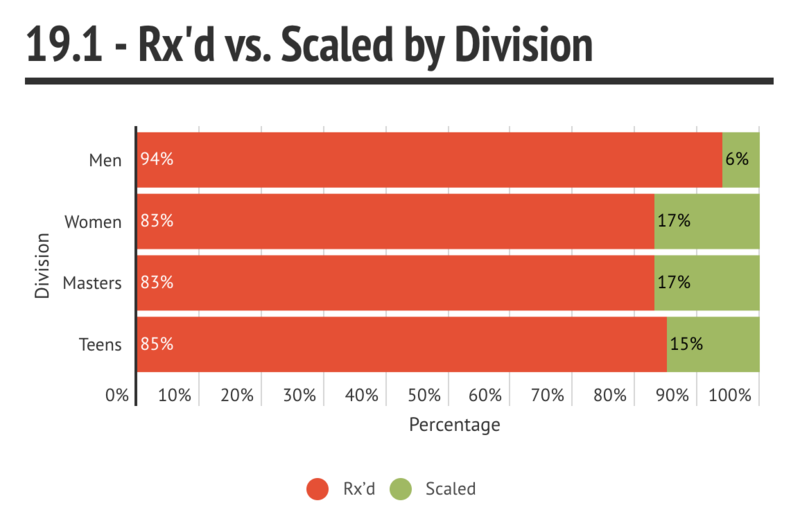 We saw a huge jump in Rx’d performances on 19.1 compared to 18.1. The absence of a higher skill movement (18.1 had toes-to-bars) seems to be a differentiator. Ninety-four percent of individual men performed 19.1 Rx’d, compared with 85 percent on 18.1. The average across the other divisions was around 83 percent, up from around 62 percent on 18.1. This workout only contained wall balls and rowing, neither of which are widely known for causing athletes to get to failure (although I’m sure some crazies on 19.1 were up for the challenge). This led to a pretty even distribution across rounds and movements for both genders. 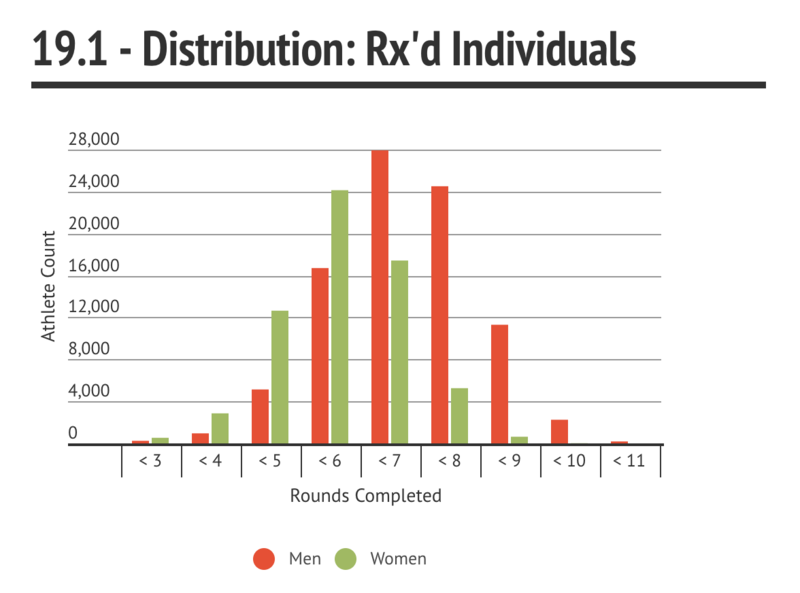 Below, we see the score distribution for Rx’d individual men and women. The median score for individual men was 254 (6 rounds + 19 wall balls + 7 row calories) and the median score for individual women was 213 (5 rounds + 19 wall balls + 4 row calories). There was a difference of 40 to 50 reps between the men and women across most of the distribution. This is likely due to the advantage that the rower gives to height and strength. Last year we saw different men and women calorie prescriptions (14/12 calories, respectively), but this year, every division did the same amount. Another thing to note on the distribution is how compressed it is. Eighty-five percent of individual women finished on round 5, 6 or 7. Seventy-seven percent of individual men finished on round 6, 7 or 8. Below is the full percentile table for all divisions. You can see the breakdown of how many reps it took to achieve a particular percentile. 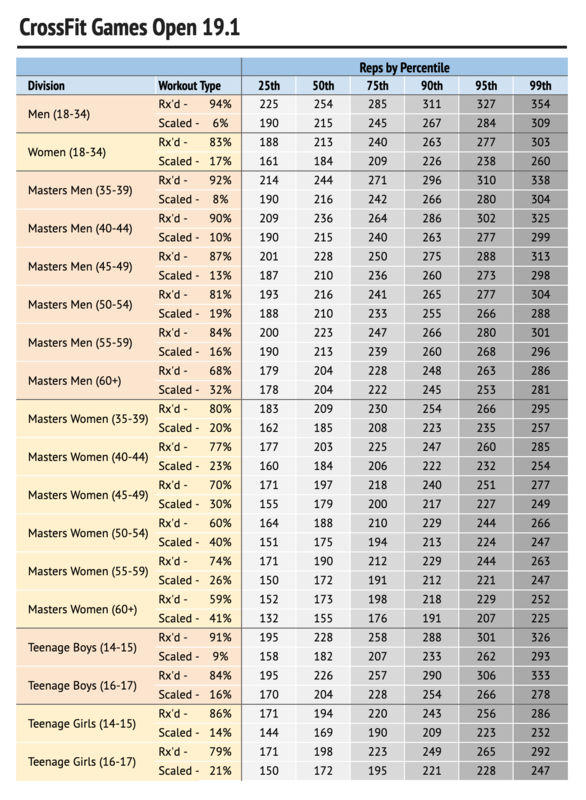 For example, for Rx’d Masters Women 40-44, you needed a score of at least 247 reps to get into the 90th percentile. You can see the percentage of athletes who did the scaled version in each division as well. *Note that these percentiles are comparing scores in the same version of the workout only, so they will differ from the Games app, which is a composite percentile including both Rx’d and scaled results in a particular division. The data used for this article is from the official CrossFit Open submissions. CrossFit btwb is the official CrossFit® workout-tracking app. Log, plan and analyze your WODs with friends at your CrossFit® box and around the world. All plans come with a 30-day free trial.